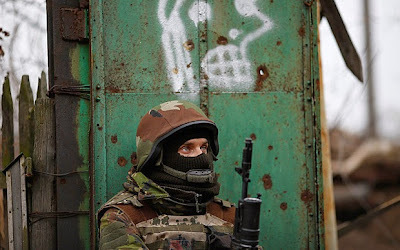 KIEV, Ukraine -- Forces loyal to Kiev are digging in to withstand an anticipated onslaught from separatist rebels. A Ukrainian volunteer fighter stands guard in the village of Peski near Donetsk. The earth from the trenches is freshly dug and the concrete of the newly-installed pillbox blemishless. The metal cage that protects it from rocket-propelled grenades is already covered in a thick layer of ice. It is hardly the Maginot line. But Ukraine commanders say that these new positions are meant to halt a blitzkrieg that Russian-backed rebels are rumoured to be readying 30 miles to the east. “They know if they come this way they won’t even get five kilometres,” said the Ukrainian officer showing off the fresh earth works. The truth is that the trenches and anti-tank ditches appearing in the fields west of Donetsk have yet to be tested. But they are a telling illustration of how the fortunes of Ukraine’s war have changed since September’s ceasefire. The Ukrainian army’s hopes of finishing the war this summer were dashed by a separatist counter-offensive in late August, which had Russian backing. Now, it is the Ukrainians who find themselves on the defensive, focused on containing the separatists rather than winning back ground. Meanwhile, on the other side of the lines, in the self-proclaimed “People’s Republics” of Donetsk and Luhansk, the separatists are busy resupplying, reinforcing, and getting to grips with the messy task of building their embryonic state. Some believe the conflict is slowly freezing, like the ice on the new Ukrainian pill boxes. But others fear an imminent and very major flare-up. In recent weeks, several vast convoys of military trucks hauling howitzers, Grad rocket systems, and tanks have been seen moving through separatist territory. NATO, meanwhile, has accused Russia of sending combat troops, tanks, artillery, and anti-aircraft systems across the border. The popular wisdom amongst soldiers and civilians on both sides of the lines is that the rebels are readying to grab the port of Mariupol, in a bid to open a land corridor to the Russian-occupied province of Crimea. So Ihor Kolomoisky, the fiercely pro-Ukrainian billionaire businessman appointed governor of Dnipropetrovsk earlier this year, has taken matters into his own hands. He is said to be lavishing vast sums of his own money on the creation of two volunteer battalions to aid the war effort – many of whom now man the trenches and three-line defensive system being built to screen the region’s eastern borders from the rebels in Donetsk. “I joined because when I did my national service I promised to defend the territorial integrity of Ukraine,” said Sergei, the “Dnipro 1” battalion officer inspecting the icebound pill boxes. Like the other volunteer battalions, Dnipro 1 was raised largely from highly-motivated volunteers committed to defending the ideals of the Maidan revolution that broke out in Kiev a year ago. They have played an increasingly important role in the conflict, swelling to the size of a regiment and serving in key battles including September’s desperate and ultimately disastrous fight at Illovaisk, when the conflict turned in the rebels’ favour. But they do not feel Ukraine’s pro-Western government in faraway Kiev is doing enough to help. “The government in Kiev is living in an illusory world,” said Sviatoslav Oliynyk, the deputy governor of the Dnipropetrovsk region. A Russian-speaking industrial centre 120 miles west of Donetsk, Dnipropetrovsk has become the staging post for thousands of soldiers rotating in and out of the combat zone and the centre of the Ukrainian war effort. Fleets of ambulances daily scream up and down the highway between the airport and the main hospital, ferrying the latest casualties brought in by helicopter from the combat zone. More than 300 soldiers have been buried in the city’s cemeteries – 161 of them, according to Mr Oliynyk, still unidentified. “To win, we need to do two things: first, stop the war, properly rather than on paper. And second, build a quality of life here that is demonstrably better than in Russia,” said Sviatoslav Oliynyk, the deputy governor of the Dnipropetrovsk region. Asked how long he expects that to take, he gives an optimistic answer. In the meantime, the conflict is slowly freezing like the ice on the new Ukrainian pill boxes. It is a tough life in the trenches. While the separatists who control Donetsk enjoy the logistical benefits and relative comforts of the region’s capital, the Ukrainians are hunkered down in the fields and villages outside the city, dependent on lines of supply from Dnipropetrovsk. In Peski, the strategic village that acts as the lifeline to the beleaguered garrison in Donetsk airport, the Ukrainians live in a vast network of trenches, tunnels and machine gun nests that comes under near-constant bombardment from rebel artillery. Further to the rear, the men live in dugouts and trailers on freezing checkpoints, or billeted in houses in the poverty-stricken country towns that dot the western part of Donetsk region. “It’s warm enough when you shut the door,” said Artyem, a fighter who has been living in an improvised cabin just large enough to fit two beds and a stove at a checkpoint for over a month. A Donetsk native, Artyem says this checkpoint will be his home until he can get back his own place in the separatist-occupied city. But perhaps worse than the weather is the sense that, despite being a local, he is not entirely welcome. Several of the towns west of Donetsk raised rebel flags before being retaken by the volunteer battalions in summer, and uncomfortable truth for Kiev is that the sympathies of many locals lie on the other side of the lines. “About seventy per cent of people around here support them,” said Artyem, who refused to give his second name. “There is a separatist lives over there,” he says, pointing towards the village up the road from his checkpoint. Perhaps because they include a number of Donetsk natives, the men of Dnipro 1 seem less inclined than some other Ukrainian units to believe that their enemies are just Russian mercenaries. “We captured a Russian paratrooper major a while back, so we know they [the Russians] are there. But along with them are the locals,” said Sergei, also a native of Donetsk. “We’re on our own land,” he added, repeating a line popular on both sides of this war. The tragic irony is that is precisely what the men in camouflage on the other side of the lines also say.